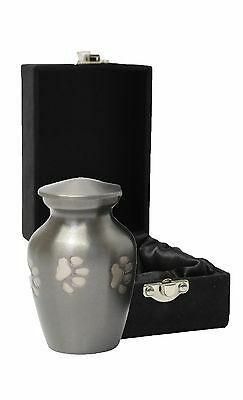 This Pet Keepsake Urn is made in solid brass and like all of our urns is completely hand made. All our keepsake urns a supplied with a high quality hand made velvet presentation box with latch. This urn measures approximately 3" tall and will hold a small token amount of ashes The Cremated remains are placed in through a secure threaded plate in the base. Colour/Finish: Slate Silver with hand engraved and painted silver paw prints.